Click here to get started on LED street lights in your community. to create a more affordable pathway to LED street light conversion for Ulster, Dutchess, Orange, Putnam, Rockland, Sullivan, Columbia, Greene and Westchester municipalities in the Central Hudson Gas & Electric, Orange & Rockland, New York State Electric & Gas, and Con Edison territories. Converting to LED street lights has the potential to deliver electricity cost savings of up to 65 percent to municipalities. NYSERDA’s 2014 study, Street Lighting in New York State: Opportunities and Challenges, found that if this were accomplished statewide, an estimated 524 gigawatt hours of electricity and $97 million would be saved annually. The project is expected to save Mid-Hudson communities more than $6 million in energy costs and reduce greenhouse gas emissions by more than 42,000 MTCO2e over the next 15 years, if only 20 (fewer than 10 percent) municipalities were to participate. Municipalities wishing to join the Community Managed RFP should email Pat Courtney Strong, . To take advantage of the Community Managed RFP, please contact . Per NYS procurement law, municipalities may “piggyback” on this RFP for a period of up to one year. The lead municipality is the Town of Red Hook in Dutchess County and there are 17 named Participant communities. This is a RFP for installation and optional maintenance, only. To maximize savings, Mid-Hudson Street Light Consortium can advise municipalities on how to procure LED lights through the state contracting system. A second RFP, for “turnkey” procurement, installation and optional maintenance of LED street lights, is in final stages of development. Assistance in understanding LED conversion options is available to all municipalities in the Mid-Hudson region (Columbia, Dutchess, Greene, Orange, Putnam, Rockland, Sullivan, Ulster and Westchester counties). To join the Consortium, officials are encouraged to complete the Municipal Membership Application and take our brief Survey, HERE. Communities are encouraged to connect with their local Clean Energy Community Coordinator for information on money- and energy-savings programs supported by the New York State Energy Research and Development Authority. A survey of Mid-Hudson municipalities to ascertain which municipalities seek assistance with conversion to LED streetlights, and what types of assistance are desired. 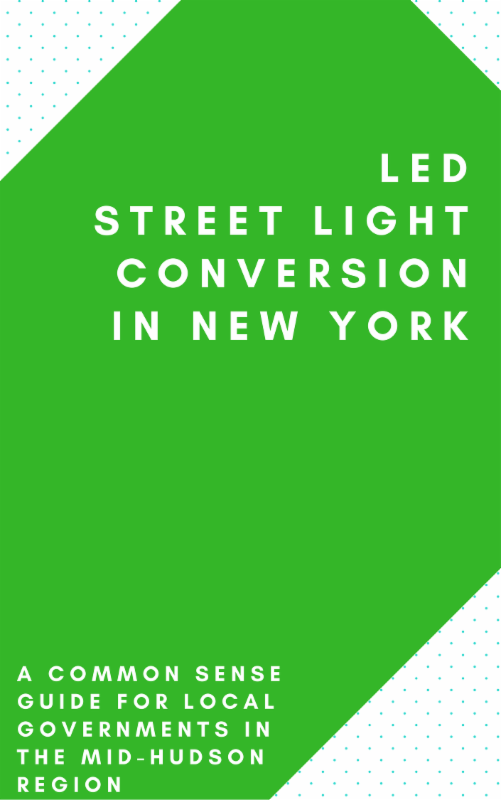 LED Streetlight Conversion in New York: A Common Sense Guide for Local Governments in the Mid-Hudson Region, a report commissioned by NYSERDA to explore the savings possible across New York State when municipalities convert to LED street lights. Read the report. Information and support for municipal streetlight audits. Audits verify currently installed equipment and may allow for utility refunds for past overcharges and/or support evaluations of appropriate replacement equipment. LED procurement support, including model Requests For Proposals (RFPs) that address furnishing, installation and maintenance appropriate to each utility territory to streamline the procurement process for interested municipalities. This will include support for an aggregated procurement process to capture volume pricing discounts for interested municipalities. Existing street light purchase support. This includes information and analysis regarding streetlight buyout terms being offered by the various utilities to individual municipalities. WEBINARS: Click HERE for the Consortium’s ongoing series, in which we provide in-depth information on the economic and technology considerations of LED street light conversion. The Mid-Hudson Street Light Consortium will provide technical assistance at no charge to municipalities that participate in its aggregated procurement offerings. After mid-2018, municipalities may still be able to piggyback on the Requests for Proposal that were initiated by the Consortium, but there can be no assurance they will receive technical assistance. For questions and/or to join the Consortium, email Pat Courtney-Strong at .